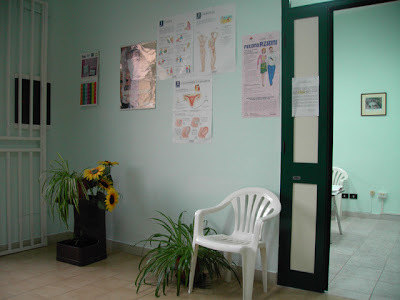 Last week I went for my annual gynecological exam. Yes, TMI, so if you’re weirded out now (or at some later point in this post), well, don’t come a-crying. I made sure to show up first so as to get out of there before noon. This meant arriving at 7.30 for a 9 a.m. appointment. Why you ask? Well because everyone gets 9 a.m. appointments–first come, first serve with a lot of “who’s last?” questions as the next woman arrives. No receptionist really, although a social worker does sort of act like one, taking the little referral slips from primary doctors and directing traffic from behind a locked door. Really. I’m only partially sure she’s a real person. 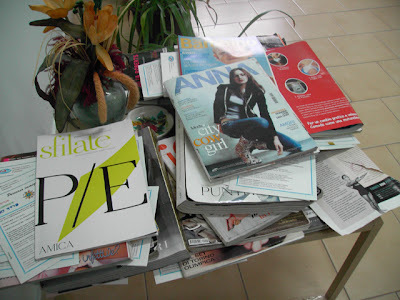 I used my alone time to swipe a few interesting articles from the Italian magazines to be discussed in later posts. But by the by, if you think I was a little over-anxious by arriving so early, by 8.10, there were 3 women after me. So I was called in first (yeah! ), and the doctor did the usual exam taking all of 8 minutes. But then she informed me that I’d have to come back for the PAP test when the technician was there. Yes, there was someone else in the room with us as well, but apparently neither of them were capable of scraping and placing cells on a slide.TMI? Sor. She also told me that she saw something that started with a “u” I think, and that I should go get an ultrasound at the hospital. She told me it was most likely nothing, that it was actually quite normal, but it’s better to get it checked anyway. And so began my GYN circus. Now I’m not going to scare you all with suspense–nothing is wrong. We’re just going to run through the process.First the GYN has to write a referral to go to the hospital. Then you can get your pharmacist (or City Hall official?) to set up an appointment via the computer. Well, the local pharmacist couldn’t do this for me because I’m a straniera — not in the sense that I’m not Italian, because I am, but because I was not born in this area, meaning my info isn’t in the computer. So P’s parents were feeling especially hospital-y and offered to guide me through the maze immediately. Which was very nice, because if left to my own devices, I probably would’ve put it off for weeks, dreading further bureaucracy. I have a quota per week, you know. And it’s very low. We got to the hospital and took our number to be served at the “make appointments” information window or whatever it’s called. We had number 90 and they were serving number 86, so it looked good–except that there were about 20 other people in the room apparently waiting for something. Yeah well, I don’t know if they were all stranieri, i.e., clueless, or what, but 87 popped up, and literally, in stunning rapid fire succession, so did 88, 89, and (bam!) 90. Apparently those in between 87 and us didn’t react quickly enough, so Happy Button Pusher just kept on pushin. Fine by me. So HBP turned Behind The Window Guy said they could take me immediately up in the GYN department, and that would be 46 euro please. Ugh. I was hoping for somewhere around 25, but fine. If it wasn’t my gynecological health, I probably would’ve thought “Now there *better* be something wrong!” but we women don’t joke with these things. See, basic health care is free, but you have to pay for the extras through what they call “tickets,” using this word in English. It’s kind of funny to hear them say it, although all humor is lost when handing over an orange-colored bill. That’s a fifty for those non-Euro-inclined. They say you can get these expenses reimbursed on your taxes, though, so my receipt is in a safe place. As you can see, we’ve settled on a charming puke green theme with just a touch (too much) of One Flew Over the Cuckoo’s Nest. I won’t bore you with the fact that even after I was called back for the ultrasound, I had to stand and wait in another hallway for a half hour, shifting back and forth from foot to foot, puppy dog-looking into the eyes of everyone in white that passed only to be greeted with lowered (shameful, I say) heads. I got back there eventually. The doctor was awesome, but first we had some ice to break as I’m sure he thought I was an idiot when he asked why I was there, and I didn’t remember anymore. I *did* know the word that started with a “u” when I left the clinic, I swear, but so many hours had passed. Should’ve written it down.Or, um, maybe the doctor should have? This doc was forgiving, though, as he inserted the Eye on a Stick, as I call it, and shouted to the nurse the measurements of my uterus and ovaries–and (this is so cool) showed me that there was an egg sac in my left ovary ready to explode. Yeah, you moms have your babies in the womb pics, but do you have a nearly exploding ovary in your files? I even got to keep the pictures, which I won’t post here on some very sage advice. But, you know, if anyone’s interested. . . . So everything is fine and in working order, should it be called upon, but as usual, it was an experience. And on the bright side, I really liked the doctor at the hospital even though he was a man. Ladies, I know you hear me on this one. Now, back to the hospital pics. 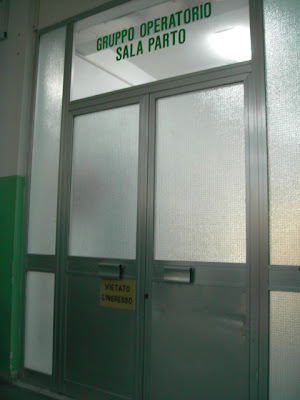 The reason I thought to take the first one was because of what had been going on in Italian news at the time–Hygiene Scandal Hits Italy’s Biggest Hospital. Perhaps some thought I was joking when I said there was paint peeling off the walls when I got my health card? Joking aside, this is serious stuff. 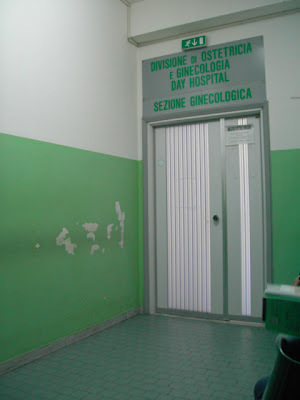 Some Italian hospitals, often in the south, have deplorable conditions–and we’re not just talking about paint. Many places aren’t stocked with certain medications because it’s too expensive. Seriously. From what I’ve read on a certain Expats site, this includes epidurals for pregnant women, which apparently you must reserve in advance, but then may not even receive if someone more worthy (?) comes along. There are also an extraordinary number of C-sections performed in the south, and many are apparently unnecessary but are done in the doctors’ pockets best interests. Then there are the types of hygiene problems discussed in the above article–dirty floors, problems with waste disposal, little to no protocol for cleaning used instruments. It’s scary stuff folks, and it’s exactly why the public health care system needs more funding and why that funding needs to end up in the right places, or alternatively, simply not in the wrong ones. Italian citizens already subsidize the care through their tax euro, paying some of the highest taxes in Europe. Unfortunately, the health care system doesn’t reflect this. Aren’t we in an industrialized, 1st world (kinda) nation here? Shouldn’t our health care correspond? There’s no reason that socialized health care can’t work, but in Italy, there’s a lot of work yet to be done. I know it’s already been addressed in the Italian media, but fellow expats, does our particular interest group need to call Striscia on this one too? oh boy, that hospital looks depressing. I mean, as if you’re not depressed already upon entering the hospital. An “egg sac ready to explode?” Never heard of that before… sounds painful. Glad everything turned out ok for you though. I hate the hospitals here. Well, at least the ones I’ve been to. I wonder if the hospitals up north are any better? What is a tmi? is the word that starts with a u an ectopic pregnancy? Giulia, not painful–it’s nature! It was just this Italian’s colorful way of saying I was ovulating. Don’t you love the way they phrase things here? For the record, NOT pregnant. Moment of solidarity – just got back from a GYNO experience…will be writing about mine with a bit of a different spin. You had a girl? I’m jealous. Can’t wait, Ms. Yes, my everyday GYN, if you will, is actually a woman–pure luck. She was kinda nasty the first time I went, but this time she was fine, so hopefully she was just having a bad day the first time around. Must immediately stop complaining about the British health service. May also have to reconsider permanent move to Italy. While I am glad everything worked out for you I hate to think of you in a less than sanitary place. Wow! Even for as much as health insurance costs here in the states, I’d take our system over the Italian one, any day! Yikes! With all of the surgeries I’ve had over the years, I’d hate to think of the conditions in which they were done potentially leading to even bigger problems. I know how lucky I am to have the great coverage through my work and after hearing of your ordeal I definitely won’t take mine for granted. To be fair, the place I was in wasn’t dirty, and I didn’t notice any shady practices happening. Yes, there’s paint peeling, and in the past I’ve seen a less than clean bathroom, but, you know, I guess that can happen anywhere. Also to be fair, there are private hospitals and private insurance that you can pay for just like everywhere else, and probably, overall, routine everyday stuff in the public system (which is what most of us use most of the time) is clean and safe. The sad part is just that tax money should be able to support better, more reliable care than it does. Oohh you are so brave, since being in Italy I keep putting off my visit. I couldn’t cope with a guy doctor down there either,even after having had 3 children. I still only feel comfortable with lady doctors. I had them and was operated at the age of 14. I should check it yearly but “I forgive”. Hate hospital and getting an appointment make me sick! hmmm, the decor might not be the nicest but at least you are getting quality health care without having to mortgage your house. Very thankful to be living in Canada with our free health care and uber clean hospitals. That’s what my brother in law does for a living. He’s an environmental services manager for one of the hospitals in our city. Which means he’s responsible for making sure the entire hospital is clean at all times. He’s constantly taking courses, going to training sessions and visiting other hospitals (both here and the US). I find the health care here to be very good. Our primary doctor is better than any we had in the USA. I feel fortunate to have him. Granted I have not been faced with any major health issue but what he has helped me with is always spot on. He even did a small operation on my head in his office once. But for the GYN thing I think I would opt to go with a private appointment. The local hospital looks very much like your photos. They are super clean but not many state of the art stuff showing. Not that they don’t have these machines/equipment but only with patients who need them. One more thing..the nurses here do a great job with limited resources. I feel for you. I go directly to a private OBGYN for this sort of thing. It’s anout 90-100 euros, but no referral is needed, the appointments run on time, and there is absolutely no run around at all. I refused to do the hospital thing after month four of my pregnancy when it was more exhausting to figure out where I was supposed to go than it was to do an extra translation to cover the cost of a private appointment. Also, watch out on the “ticket” costs. They tell you it’s tax deductible, but only after you’ve spent a certain about (I think it’s 250 now, but not sure) and only for a certain percentage. So it’s like you spend 50, you save 50. More like you spend 300, you save 60 on your tax return. Watch out for those Italians. They play games like that. Which reminds me. I also was denied pain relief during labor after reserving an epidural and showing up with all the necessary documents. that thing that starts with a “u” is probably a uterus! congratulations! you have a uterus! i had a HORRIBLE hospital experience in naples back in april. i will never go back.